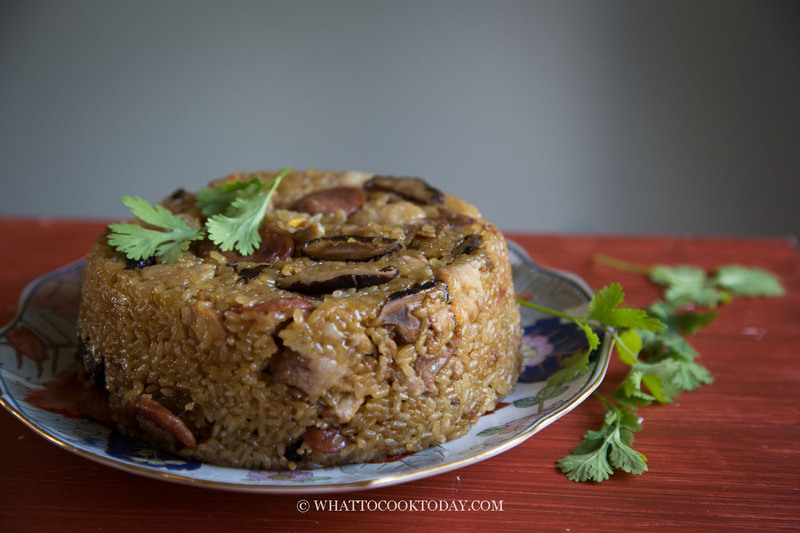 No Wrap Easy Pressure Cooker Zongzi – Not sure how to wrap zongzi? Learn how to make Chinese pressure cooker zongzi without all the fuss of wrapping and long cooking time. 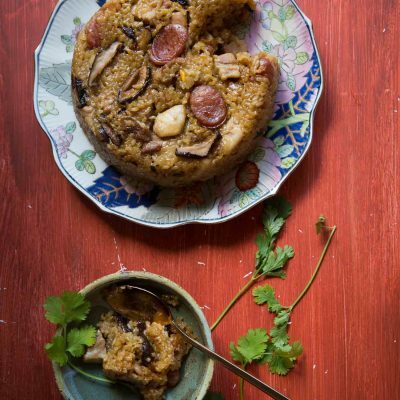 This no wrap pressure cooker zongzi cooks quickly and have that same great taste. This no wrap easy pressure cooker zongzi (sticky rice dumplings) is for those of you who have been craving the taste of traditional zongzi but do not want to go through the hassle of wrapping and the long cooking time. Yup! That’s me this year! I made the traditional zongzi last year and the year before that. This year with all the DIY projects, I simply don’t have the time for that! WHY THE ZONGZI IS MUCH DARKER IN COLOR? The zongzi I made here is more of the Indonesian Chinese version, where the sticky rice picks up the color from the dark soy sauce. I know the Chinese version is much lighter in color. You can omit the dark soy sauce if you want to. I love the convenience. There is no soaking of rice necessary and the cooking time is so much shorter compared to the traditional way of boiling it for 3-4 hours or longer!! I only need to pressure cook it for 30 minutes! Are you on board yet? CAN I USED BAMBOO STEAMER TO COOK? My husband was very impressed with the taste. He said it tasted like traditional zongzi, minus the bamboo leaves wraps. Even the kids found this version very yummy! Not sure how to wrap zong zi? Learn how to make Chinese zong zi without all the fuss of wrapping and long cooking time. This no wrap pressure cooker zong zi cooks quickly and have that same great taste. I just made this, and the taste is pretty good; i added some peanuts (soaked overnight first). However, the pork belly did not come out like the melt-in-your mouth texture. 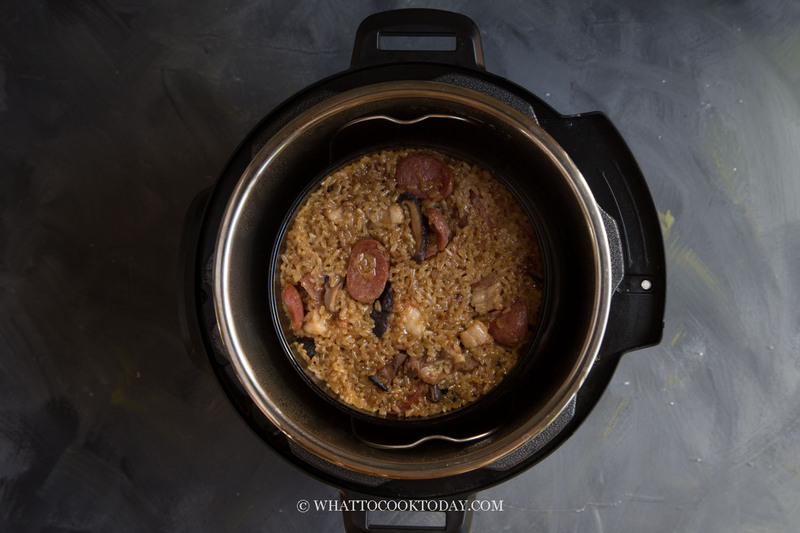 It seems that the pork would need 90 mins in the Instant Pot on high to do this, but this might make the rice and other ingredients too mushy. Do you have any suggestions for this? 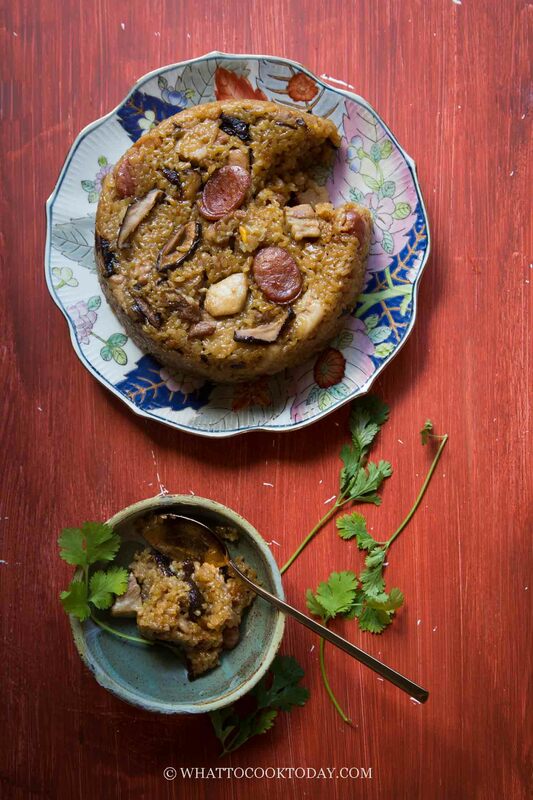 Perhaps not cook the pork on the pan, but separately in the Instant Pot for 60 mins first, and then combine with the rest of the ingredients (rice, chinese sausage, mushrooms, etc) for 30 mins? Thanks! Hi Michael, if you really want the melt-in-the mouth texture, I suggest cooking the pork belly (in whole, not cut) in IP pressure cooked on high for 30-35 minutes and then sliced and combine with the rest to cook again for another 30 minutes. 1 hour total should be tender enough. anyway to have the measurements in grams as I might want to make 1/2 of this recipe. thanks! Hi Jos, I’ve just included grams in the recipe. How long to reheat frozen zongzi in instant pot? Whenever I’ve tried to reheat the outside steams nicely but the inside is still cold. I’ve never tried to reheat frozen zongzi in instant pot before (I should now that you mentioned it). I usually just use a regular steamer and steam on high for 10-15 minutes. I’m not sure what setting you use, but you can put the zong zi on the trivet, fill up the inner pot with about 1 cup of water. Close the lid and set on high pressure and set timer to 10 minutes (for small zong zi), for bigger one I would do 15 minutes and release pressure immediately after the timer is done. Hope this helps!